Fun Adventure Path for Your Varisian Legacy Characters! 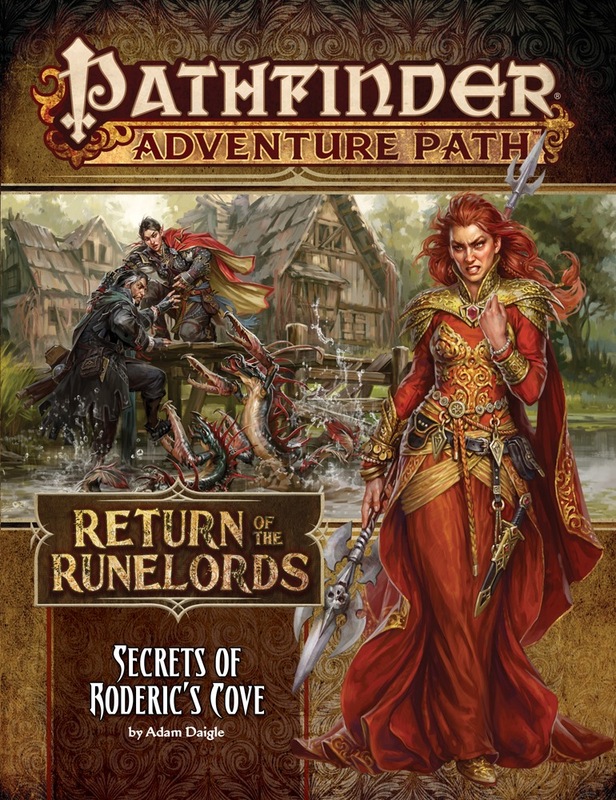 Secrets of Roderic's Cove serves well as the start of the Rise of the Runelords adventure path and is strong enough in its own right to serve as a stand-alone adventure if desired. Since it covers a level 1-5 range, it could even serve as an entire campaign for somebody using the Beginner's Box if desired. The town of Roderic's Cove has many problems, from a mini-gang war to the appearance of the ghost of the town founder. The order in which the PCs solve these problems depends on their choices. All told, the adventure features several dungeons, a monster-filled wilderness, a haunted house, and a mansion whose infiltration calls for stealth and guile. This is in addition to several encounters in the town itself, from monsters that attack in the night to the chaos caused by a renegade grimple. 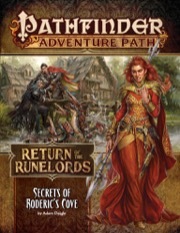 Secrets of Roderic's Cove is much more of a sandbox than most other 1st-level adventures, and it serves well to establish the PCs as individuals with their own agency. The adventure path calls for a group that is willing to be proactive and solve problems in their own way, and this adventure sets that tone nicely. It would have been nice to see more guidance in certain areas - the aforementioned mansion could be difficult to run for a GM who doesn't handle infiltration missions well, for example. I also miss certain adventure path features such as the foreword and the fiction, but I understand that certain sacrifices have to be made for the line's first 1-20 non-mythic adventure path. Overall, this book is a strong start to a campaign and a good adventure to have even if you don't plan to run the full path. First, let me qualify this review. This is not a read-through review; our group has played this adventure and it’s not all that different from any of the other introductory modules of which we've played in nearly half of the APs Paizo has published over the past decade. It is quite serviceable and, as advertised, disposable pulp fantasy, complete with the requisite tropes. If you're looking for award-winning prose or groundbreaking character development, it is in short supply, but this seems to be standard and the norm for monthly canned modules like these. Even so, there's a lot for GMs to work with: a fleshed-out location with ample NPCs, a clear tie in to the next module, and enemies who, if played with nuance, skirt the line between ally and enemy. The encounters are appropriately difficult for a system that's now so bloated with exploits. Groups looking for cheap thrills and plenty of them will be satisfied as the module trends towards quick advancement and steady, generous treasure acquisition. Does it need some extra love from the GM, well yes – show me a module that does not. Does it live up to the previous installments in the Runelord franchise, I'd say, yes, close. We lack singing goblins in this one, but, memory has a funny way of making those past installments better than they actually were and it's challenging to go up against that type of nostalgia in a world increasingly suffused with critics. Into book three of this ap; have played six other ap’s and this is hands down the worst ap. The story is extremely underwhelming and feels like it was written as a “where are they now” tour of previous ap’s. If you want to take a tour of previous ap's NPCs and locations then this is the ap for you. If you want a good story I’d try any number of other ap’s. The underlying structure of this story is not great, and the writing doesn't help. For the first book in an Adventure Path, this one leaves me underwhelmed and slightly nervous to see what follows. It seems like a rough first draft, and it gives me the same impression of Ultimate Wilderness, where not enough time was taken to craft a publication that is worth distributing. I hope it was just a one-time thing, and that the next books will be back up to the usual standard of quality for APs. I find that the AP books are increasingly filled with great ideas, and the quality has been top-notch for quite a while. When I read this book, I was constantly thinking about how I'd have to re-work things to make the story coherent, or thinking of details I'd have to add where none are provided in the book. The text (room descriptions, faction descriptions, NPC description) gives very little fuel for the imagination. They largely focus on back-story that is irrelevant to what the PCs might encounter. For example, one room takes an entire paragraph to describe where the long-dead family sat in this room when they ate their meals. That does nothing for me as a DM. Instead, why not say that the following can be found in the room: "A child's toy; a carved drawing on the table. An old bracket on the window where a telescope used to be. A hand-crafted high chair for the youngest child that's now rotting." Something that the characters could actually discover. I find myself continually frustrated by the unusable text in the book that makes it a chore to read. Some room descriptions simply repeat what's obvious on the map (and also given in the read aloud text): "This hallway stretches from the front door and curves at a right angle before ending. A set of rickety stairs ascends to the house's second story." This is obvious from the map, and to make it worse, the read-aloud also says: "A set of stairs rises to the next floor, and the hallway turns sharply to the north past the staircase." None of this adds anything I couldn't just tell the players from looking at the map. There are four different groups involved in this book, and the relationships between them are over-complicated and unnecessary. Several of the groups are hard to realistically imagine living in the town. The groups (and all areas) also feel static, like they're waiting for the PCs to arrive to interact with them. The descriptions of the groups are insufficient to determine more dynamic interactions and motivations, and these brief descriptions sometime contradict the way they're encountered. For example, there is a group of "frustrated workers and struggling individuals from the lower classes who hope to make a better place for themselves in Roderic's Cove - a sort of informal and rough-around-the edges labourer's guild." This sounds very realistic and compelling to me. However, the group is named the "Horned Fangs", and their members seem to be hanging out in a dungeon, waiting to attack. All the verisimilitude is lost, as is the potential complexity of dealing with co-opted members of the town. Another group is led by an old witch-like oracle who seems completely out of place with the rest of her members, and there is literally zero description about her motivations, or why she leads the group. The macguffin in the book could provide a great lead-in to the dangers of the following books, but everything is strangely capped off at the end of the book. The only motivation the PCs have at the end is to follow an NPC's advice to research the macguffin they found. I can think of a number of ways this could have been done better. (The macguffin also uses a power at the start of the story that is not usable by PCs. There is some description of why this happens, but it will never be obvious to the PCs, and is potentially confusing). TL:DR - This book doesn't match up to the usual quality of PF AP's. I'm writing this to express my concern, and my hope that the next books in this AP match what we expect in terms of cohesive and compelling writing, and as a tool for GM's to create great stories from. Sleepy coastal town in Varisia ... Runelords ... sinspawn ... count me in! I sense a mythic game in the making, considering we already know where Sorshen is hiding and both her and Xanderghul are specifically stated to be mythic. Currently Karzoug and Krune are confirmed dead. I would be extremely shocked if the PCs actually go mythic, given previous developer experiences. More likely, there'll be some sort of benefits granted or artifacts acquired that bring the PCs up in power without granting mythic tiers. Don't forget that the Rise of the Runelords PCs and the Shattered Star PCs - complete with Sihedron - will affect this AP as well. Also, I'm not sure that Runelord Krune's defeat by the Pathfinder Society "counts". PFS is kind of its own plotline. That said, it might be factored in. Based on James Jacobs' comments about five runelords, yeah PFS defeating one of them is in the continuity. Could yet be all 7 runelords still since James has confirmed time travel elements in this Ap. I wouldn't be surprised if there were several mythic foes there though, WotR taught us that a regular non-mythic party of PCs can handle those just fine. In fact, mythic makes for great system for spicing up encounters without artificially inflating HD or doing the dreaded "It's an advanced dire celestial shadow divine guardian fighter boar, you better either have HeroLab or an hour of spare time for statting this up" thing. "Yes, yes, I'm sure you have unique spells and amazing magical tactics that you've developed over decades. Let's see how well you fare when I take all that away..."
This is definitely on MY list! I can't wait. Can't we switch Return and Crown? Personally I am really sick of necromancers in general. I have to agree Set, an abjuration specialist would be different and interesting. You like forewords that much? I mean, they're fun and all, but I buy AP for adventures and support material, forewords are rather low on my list. It's NAZIS. The apostrophe is redundant, because it's not a possessive. that's unusual. the first thing I read is the cover. "Nazi" is not an acronym, so spelling it in all capitals is incorrect. Also, more to the point, what does it matter if someone spells something wrong? You're on an internet forum. So long as you understood the idea being expressed, it doesn't matter. Language exists to communicate ideas, and I honestly fail to see the point of "correcting" how an idea was communicated when it was still communicated. I am very phonetic in my spelling patterns, so especially if I'm not paying strict attention, I tend to use the wrong form of similar sounding words (there, their, etc....) and those are not often caught by spell check either. Punctuation rules are often confused by my autism as well....so it's good for me to see corrections. Yeah, nighttree did appreciate being corrected a while back, so I kind of followed up on that. After all, some people come to Internet forums to Polish their English, like I do. ...could there have already been hints of this in one of last season's PFS scenarios? Riddleport has the Cyphermages faction. Alaznist had a research lab that the Pathfinders found. Fiery wrath is specifically noted, so the Runelord of Wrath sounds prominent. There is a rumor that she created the reefclaws, which show up in a PFS scenario in Riddleport. It may also make part of this an aquatic adventure, as well? Man, the game of “Hardy Boys novel or Pathfinder AP title” gets harder every month. Let's not get to carried away with spelling or grammar derails in product discussion threads. checks calendar, nope not yet. checks again, nope. this is going to be a hard wait. I can't wait to see what Adam Daigle does as an adventure writer! All of the Runelords? Levels 1-20?! Time travel?!! I'm looking forward to get a map and gazetteer of Roderic's Cove (pop 1,100), as it's comparable to Sandpoint in size (pop 1,240). From the titles of the other AP parts, i also wonder if and how the face of Varisia may change during the storyline. But also, alas, no plans for Alderpash. Though I suspect if I get around to running this I will try to shoehorn him in somewhere. There are nearly 50 runelords who existed over the course of Thassilon's run, of which the majority we've said nothing about. More than the seven last ones will have roles to play in Return of the Runelords, I suspect. Alderpash included in perhaps a small way. We'll see! There are nearly 50 runelords who existed over the course of Thassilon's run...More than the seven last ones will have roles to play in Return of the Runelords, I suspect. Wait 50?!! Holy crap on a stick! I mean I knew there were more than the original seven but...50?!! There and back again !!! Let it come to papa !! !